Guess How Long to Live in it and Win a New 2011 Stang! Here’s a new, fun contest from AmericanMuscle: How long do you think someone can sit in a new Mustang and outlast three cabin mates in order to win that Mustang? Maybe weeks and weeks. Honestly, the twisted minds in AM’s contest department don’t care about that. What we want to know is how long it takes a person to get fed up with the others in the car, quit the contest, and leave the car. Now that takes guts. Make a guess – but you only get one – and submit it via the form below. If your entry is the winner, you’ll receive a nice front end appearance prize consisting of new headlights, a billet grille, and chin spoiler for your own Mustang. There are quite a few Mustang enthusiasts who would do almost anything legal to bag a free 2011 V6 Mustang (with Pony Package). Living in one for a couple of weeks with three complete strangers, though? That might be stretch. Right now, hundreds of potential contestants in the Philadelphia metro region are vying for four slots to live in a new Mustang. Then, the real competition begins. Starting June 21, 2010, four finalists will climb into that Mustang, and stay there as long as they can hold out. 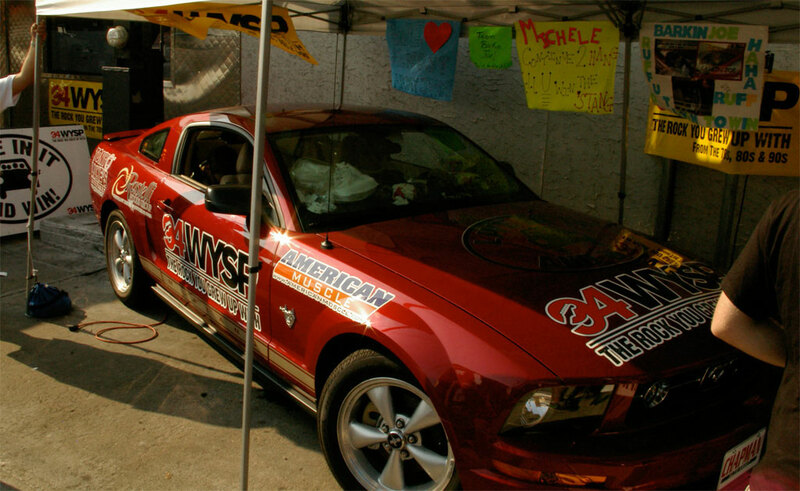 The last person remaining in the car during rock station 94WYSP’s “Live in it and Win” promotion gets to drive it away. Sounds easy, right? Well, consider that the intrepid contestants have to set up camp in the car, 24 hours a day, with only minimal bathroom breaks, and a very stringent set of rules regarding behavior in the car during the contest. It makes for an interesting few weeks, to be sure. AmericanMuscle is giving our loyal customers the opportunity to join in the festivities. Simply make a guess on how long it takes for the first person to bail out of the car (days, hours, minutes), and if your guess is closest to the actual time, you’ll win a sweet front end prize package for your own Mustang. The prize includes a set of Raxiom headlights, a Stack Racing billet grille, and a chin spoiler. So, get your game face on, and submit an entry! Remember, we want to know when the first person will leave the car, not how long the winner stays in the car. Entries will only be accepted from the form below. Only one entry per person – multiple entries will disqualify all entries from the same person. Entries must be received no later than midnight, 6/20/10. In the event of more than one entry with the winning time, contest winner will be determined by random drawing from all correct entries. To get you started, here’s some great images from the 2009 Live in it and Win contest! Update, 6/21: Here’s a video from Day 1 – entry time was 07:00 on the dot. Update – 6/22/10: We’ve received word that the first person bailed out of the car at 12:13 today – that’s one day, 5 hours, and 13 minutes into the contest. 435 entries to the contest were received in just over four days, and right now, we’re crunching the numbers to determine the winner. Thanks to everyone who participated! 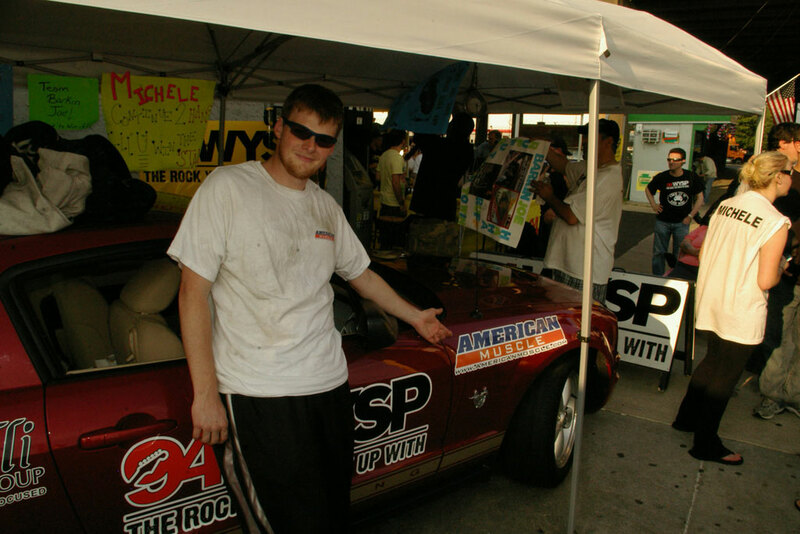 Update – 6/25/10: 94WYSP’s Live in it and Win contest is still going strong, into day five. Three contestants remain in the car, and it’s starting to turn into a test of endurance. You can click on the link above for updates, and see video and a live webcam of the contestants. The winner of AM’s “Guess the time” contest is Jake O., from Indiana. His entry was 1 day, 5 hours, and 23 minutes, and his guess beat out his closest challenger by 3 minutes. Our hearty congratulations to Jake! He’ll receive a nice front end appearance package for his 2007 Mustang GT. Previous Entry Why Should I Use Nitrous? “It doesn’t say anything about eliminating your opponents without touching them! Heck, I know I’d win in the first hour if that and not just one but all three of my opponents would jump out of that car! My farts stink so bad that the two in the backseat would’nt bother getting out through the front passenger door but pull down the back seats and crawl into the trunk, pop open the trunk lid with the emergency lanyard lever and fall out barely escaping! My farts are so nasty that they’d clear out a whole room and sometimes 2 rooms if there really that bad! And yes, I’m very proud of my disgusting gas habit! Heck, who wouldn’t do just about anything in the rules that are allowable to win this car! It’s a 2011 V6 Mustang with approximately 100 more horsepower than the 2010”!!! Someone’s pranking you, your name is on a really stupid post on this blog! Yo Chris, you don’t need to fart to make people leave the car, just tune the radio to Danny Bonaduce’s show! People would jump right through a closed window to get out, or else kill themselves to avoid hearing him! How & when will we know who won the raxiom kit. I was roughly 45 mins short?? It is useless to put people into competitions like this that bail during the second day. If I had that spot I would be in there for at least a week and a month if needed, actually I will stay in that car for how ever long is needed to win.